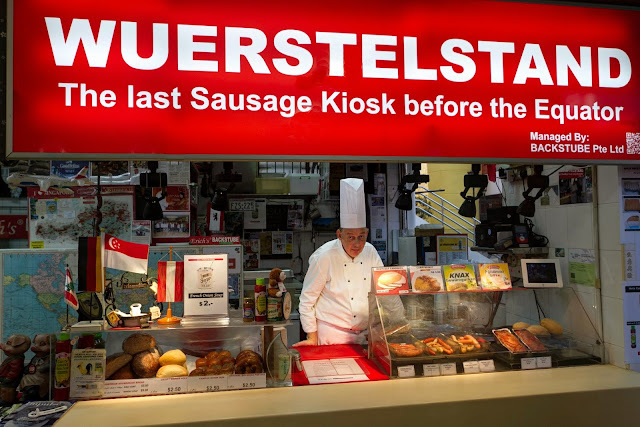 Erich's Wuerstelstand continues to be the most published sausage kiosk worldwide. German TV station "Das Erste" was the 1st one to visit Erich in the new year followed by "Oberoesterreichische Nachrichten" and more have already announced their visit in the days and month to come. And the jealousy among the Chinatown kiosks grows the more TV teams, news and magazine reporters show up for video or photo shootings. Many are asking: " Why such a big hoohah about this guy? He's just selling ordinary sausages!" First of all, Erich's sausages and bread are far away from being ordinary! His products are of best quality ingredients and highest processing standards. Secondly, Erich is not complaining about bad economy or less visitors all the time. He tries to be creative in changing his and the kiosk's looks according to seasons or events to attract more customers to try his products and so far his concept worked well. Thirdly it's not only Erich who is benefiting from this media hype about him. Since his kiosk is in midst of Chinatown and CT is always mentioned as well in the stories people have to walk through the narrow lanes there to get to Erich so it's a win win situation for all. To read the whole OON Report (in German only) just click the picture blow. You haven't been at Erich's lately, how come? You should get there now. 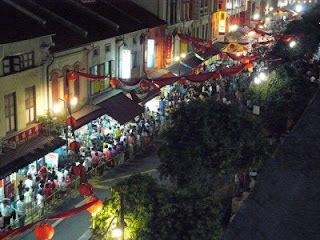 The Chinese New Year Market is still on till Jan. 23. 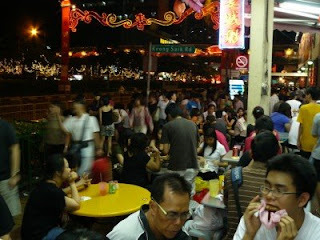 No need to be afraid of crowds, it's not that bad and after all that is part of visiting a vibrant market, isn't it? Hungry and thirsty after strolling around there's Erich's Wuerstelstand and Stanley's Fruit Juice Bar to satisfy your desires and re energize your body. 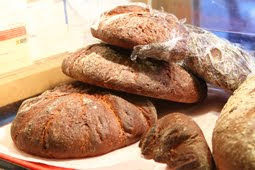 And don't forget to "take away" some bread (Semmel, Bretzel, Multi grain, Onion bread, etc.) for your next breakfast or meal. It's worth going there, honestly! See you soon! STURDY, EARTHY, NO-NONSENSE - THAT's THE OX. Affectionate and easy-going, the Ox can show a fierce temper when agitated. He is neat, tidy, quiet and studious, with a great love of his home. 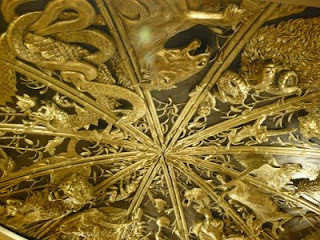 He is a revered animal who also symbolizes diligence, reliability, sincerity, strength and sound judgment. Music can be a great love. Family life and a loving partner are high on the Ox's priorities, a wonderful loyal friend. But, don't expect these lumbering souls to have a sparkling sense of humor or be style conscious...it's not part of their precious package! -Similar to Western Astrological Signs: "Capricorn" with some features of "Taurus"
The Ox will see an overall improvement in his situation during his birth year, particularly enjoying interaction with others, either with friends and family. A key phrase to bear in mind this year is 'hold fast'. There may be some setbacks or delays, but if the Ox remains calm and persists, all will be well. There will be an opportunity to study and learn (in common with other signs this year) which should appeal to the Ox not to mention the pride that comes with what is achieved. Between May and July there are significant developments on the work front, in particular important talks with a boss or superior, while September to November will see interesting and delightful romantic encounters! J.S.Bach, Pr.Diana, R. Gere, Napoleon, M. Streep, Whoopi G.
Robert Altman, Hans Christian Andersen, Warren Beatty, Jim Carrey, Charlie Chaplin, George Clooney, Bill Cosby, Tony Curtis, Diana ó Princess of Wales, Marlene Dietrich, Walt Disney, Patrick Duffy, Jane Fonda, Gerald Ford, Michael J. Fox, Peter Gabriel, Dustin Hoffman, Anthony Hopkins, Billy Joel, Don Johnson, Mark Knopfler. Burt Lancaster, Jack Lemmon, Eddie Murphy, Paul Newman, Jack Nickolson, Billy Ocean, Gwyneth Paltrow, Oscar Peterson, Colin Powell, Robert Redford, Lionel Richie, Rubens, Meg Ryan, Bruce Springsteen, Lady Thatcher, Vincent van Gogh. The Chinese method of identifying every year with animals has greatly influenced most people, even those living in western influenced countries. So much is its influence that people’s personality and character are often regarded in relation to their Chinese horoscope more than that of its western counterparts. The 12 animals representing the Chinese calendar years (repeated every 12 years) are: Pig (1911), Rat (1912), Ox (1913), Tiger (1914), Rabbit (1915), Dragon (1916), Snake 1917, Horse (1918), Goat (1919), Monkey (1920), Rooster (1921), and Dog (1922 ). 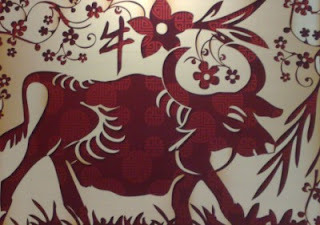 In the Chinese year, 2008 was represented by the Rat, while 2009 will be the year of the Ox, which will start on the 26th of January, the first new moon of the year. 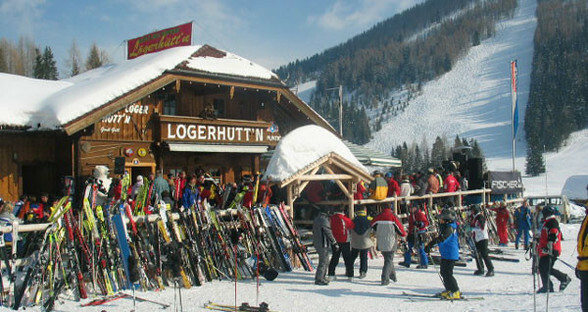 This will mark the beginning of the 15-day festivities, which will continue until February 9, 2009. 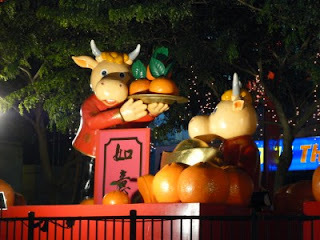 Preparations are already undergoing to make the celebration of the entry of the year of the Ox a magnificent one. 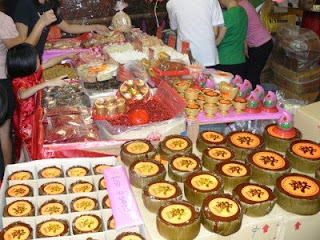 Traditional pineapple tarts and other CNY cookies are baked. People are buying New Year cloths and new shoes. In old China people started well in advance of the New Year's Day. The 20th of the Twelfth Moon was set aside for the annual housecleaning, or the "sweeping of the grounds". Every corner of the house must be swept and cleaned in preparation for the New Year. were put on the walls or on the sides of the gate-ways. These couplets, short poems written in Classical Chinese, were expressions of good wishes for the family in the coming year. 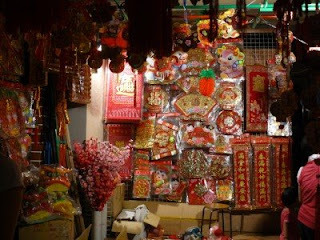 In addition, symbolic flowers and fruits were used to decorate the house, and colorful New Year pictures (NIAN HUA) were placed on the walls. GodAfter the house was cleaned it was time to bid farewell to the Kitchen God, or Zaowang. 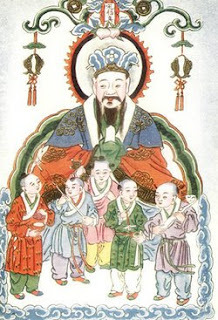 In traditional China, the Kitchen God was regarded as the guardian of the family hearth. He was identified as the inventor of fire, which was necessary for cooking and was also the censor of household morals. According to legend, the Kitchen God leaves the house on the 23rd of the last month to report to heaven on the behavior of the family during the last year. A negative report by the Kitchen God means a family will suffer from bad luck during the year to come. In order to ensure a favorable report from the Kitchen God, the custom evolved of feeding him Sticky Cake (Nian Gao). Some said this was either a bribe, or simply a means of ensuring the Kitchen God's mouth was too full of cake to pass on an unfavorable report. Sticky Cake is steamed (as are most Chinese cakes) and made with glutinous rice flour and dried fruit. Traditionally, Sticky Cake is made with peen tong a traditional Chinese brown candy that is available at Asian markets (the glutinous rice flour can also be found at Asian markets).At this time, the family did everything possible to obtain a favorable report from the Kitchen God. On the evening of the 23rd, the family would give the Kitchen God a ritualistic farewell dinner with sweet foods and honey. Some said this was a bribe, others said it sealed his mouth from saying bad things. 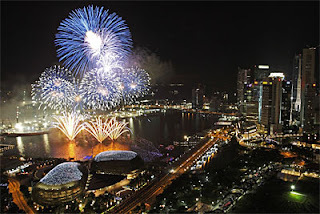 With a deafening noise when 128 strands of firecrackers were fired off and a crowd pleasing, 3 minute, firework the celebrations for Chinese New Year officially started Saturday night. Deputy Prime Minister Wong Kan Seng, Dr. Lily Neo, MP for Jalan Besar GRC and many other guests were delighted by the different, exciting performances. 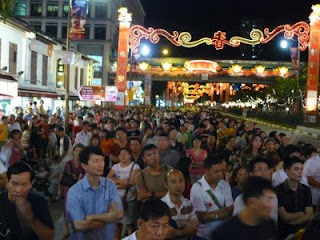 Thousands of Singaporeans and tourists followed the 2 hour long spectacle on Eu Teng Son Street. The lanes in Chinatown were more than crowded and the human traffic came to a near breakdown once in a while. However the mood seemed to be good despite the current economic situation and the uncertain outlook. 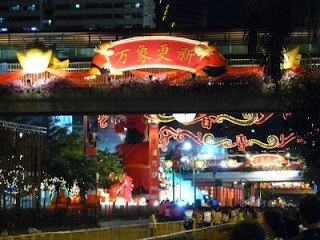 People are putting their "hope (and happiness)", which is also the celebration theme, in the upcoming lunar new year, the year of the Ox. A lot of hope is what people need because the last three Ox years (1973, 1985 and 1997) were dreadful for stock markets. The bulls kind of stayed away from the stock markets whenever their year appeared once every 12 years. With economies around the world still suffering from the horrible 2008, the coming Year of the Ox seems to be under the same depressing constellation for the stock markets as the last three Ox years. 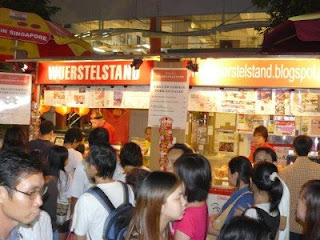 The 588 street stalls are also hoping for a good enough mood of the visitors to buy and not only "window shop". 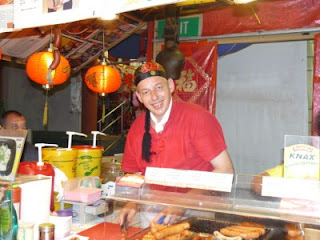 One category of business did already quite well on the opening night: The food stalls! 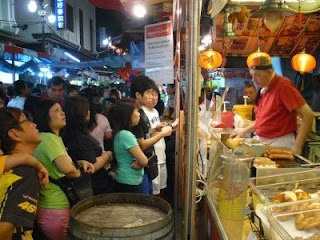 Eating, Singaporeans favorite pastime didn't show a slow down at all since there were long queues at almost every food stall in Chinatown. A traditional Chinese New Year cake. Erich's Wuerstelstand was no exemption. 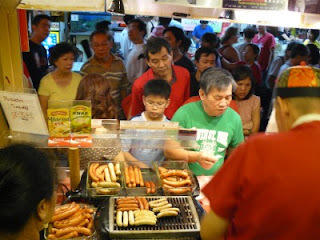 It looked like everyone wanted to buy sausages and bread from the "crazy" ang moh who changes his looks according to the season and after Santa is now a "Chinaman". Erich always smiling despite the stressful weeks ahead.
" Ta pao or eat here?" If you want to learn more about the ox year, keep it here and check out the next posts. May you come to Erich's more often - than you did last year- to enjoy his delicious sausages, meat loaf, his bread and pretzels that will make you relax and forget for a while all the crabby things about your stressful daily live and listen to Erich's wisdom ("Erich erklaert die Welt", not Confucius but Erich says......)!